Save 50% building your Hoop Greenhouse. Bend your own steel tubing Hoop House. Thousands of happy gardeners already have. Need Help? Questions? Call 903-497-1158. Our Greenhouse Hoop Bender and Greenhouse Supply Products were designed exclusively for the Homeowner Do It Yourself Gardener. Expect a savings of 50% to 70% when bending & building your own hoops compared to the cost of Ready Made Greenhouse Kits, PLUS, because all of the materials are already available in your local hardware stores, you wont be paying those high shipping/freight costs on those heavy greenhouse kits, of which in these days, could cost hundreds of dollars. 1 3/8" to 1 3/8" Tee Clamps, many different uses such as connecting 1 3/8" hoops to 1 3/8" base frame. 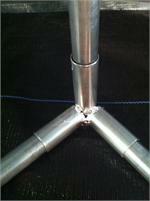 For Low Tunnel hoops made from 1/2" emt tubing. Use these connectors anywhere you need to connect 1/2" emt straight tubing perlins length wise to your 1/2" emt hoops. (screws included). (screws included). 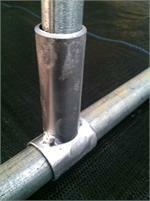 3 way corner for 1/2" emt hoop to base connections, used on all portable low tunnel construction using 1/2" emt. Plastic Snap Clamps for 1/2"emt tubing are used to attach Agribon or Poly covering to 1/2" emt metal tubing hoops. Clamps may be white or green depending on our on and stock.